You must be a member of the Lusaka Mingle n Wiggle Group to attend this activity. Would you like to join this group? 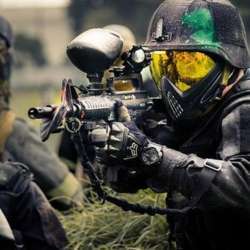 We are glad to start the year on a happy and energetic note with paintball. So put on your comfiest clothes, running shoes and put your game face on. Car pooling is advised for those who don't drive, get in touch with me,Tabi and other members who will have signed up for the event. Charges are Protected content and this covers Protected content And safety gear. Sodas, juice and water will be on sale at the venue.